Liberator TD is a glorious mix of tower defense and top down shooter genres set in a sci-fi world. Tasked with the mission to establish a new colony on a distant planet, you find yourself in grave danger of the local wildlife. Gear up at the armory, set up the static defenses, fight off the enemy and solve the mysteries of the planet! Follow LTD on Steam! Thank you! Equip one of several available armor types - each with its own abilities - and get a stockpile of various landmines ready. Level up your character and enhance your skills. Pick your loadout from a wide range of guns from a pistol to the pulse minigun. Upgrade your weapons to make them even more deadly. Build all sorts of turrets - disc turrets, rocket turrets, plasma turrets and many others. Each one gets more and more impressive with every upgrade. Shoot and squash those bugs, face their more advanced counterparts, and engage in combat with dangerous bosses and mini-bosses. 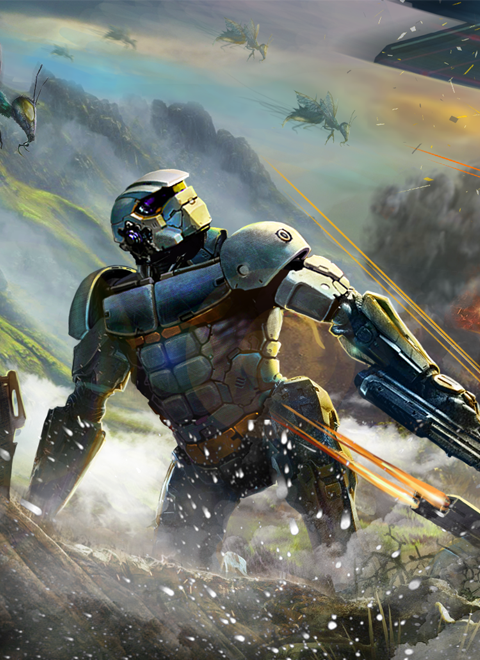 Unleash the combined firepower of your weapons, turrets, and mines. Or invest heavily into a single path instead. Choose your own playstyle and figure out the best strategy to complete each level. You have arrived to colonize what turned out to be a hostile planet. What isn't the on-board AI telling you? There must be more to it. Explore the planet and find out if you're truly the only person on the surface. We hope you enjoy your game! Thank you for your support! Long time we have not seen, right? A lot of time has passed. Since then, we have advanced very much in development, and now no one old demo can describe our game. We are very pleased to present you a new, energetic Liberator TD trailer. We really want to know: what did you feel when you watched it? Did you feel the dynamics? Have a desire to play? Was everything clear? - Please share this in the comments! With the help of this trailer we are already looking for a publisher at all, and every day we are getting closer to the release.From the release on the PC we are stopped only by the absence of the publisher. The PC version is ready, it remains only to polish the small details a little before the release. Mobile version is under development. You can go to Steam and Add it to your "Wishlist"
LIberator TD got Greenlit on Steam! We've done it! Liberator TD successfully made it through Steam Greenlight! Thank you! Our tower defense / top down shooter mix has been updated with new content and improvements, and so has been its free demo version. The Steam Greenlight demo of Liberator TD (v0.9.3.2) - download and play now! The downloadable steam greenlight demo of Liberator TD.